Two of the most important financial decisions people make are when to start receiving Social Security retirement benefits and when to stop working. These actions do not have to occur at the same time, and they have lasting consequences for the financial security of retirees and their spouses. Social Security benefits can be taken at any time between 62 and 70, and there are sound financial reasons to delay benefits if you can. If you wait, your monthly benefits will be higher for the rest of your life. Waiting even a year or two helps. If you need Social Security to make ends meet, take it – you've earned it. But if you can wait, even a year or two, your monthly benefit will be higher – for the rest of your life. If you're married, you have two lives to plan for. If you are the higher earner, waiting to take Social Security means providing a higher survivor benefit for your spouse if she or he outlives you. View NASI's toolkit of materials on when to take Social Security benefits – including a short video (available in English and Spanish) and a fact sheet. 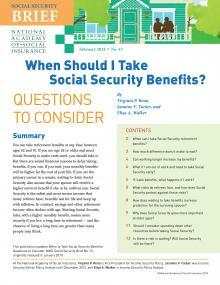 This publication updates NASI’s 2010 brief, When to Take Social Security Benefits: Questions to Consider.